If you’re a Christian, then you believe in the power of prayer. It’s pretty fundamental … prayer is fundamental to our relationship with God and our daily life with him, and even salvation itself. So where does the power of prayer come from? Does it come from the words we speak like some ritual incantation? Does it come from the power of our minds? Or does the power of prayer rest solely in God and his power when he answers our prayers? One gets the impression from reading Dr Leaf’s e-mail newsletter today that the power of prayer is less about God and more about the power of the human mind. That may well be true, but the effect isn’t related to prayer itself, it’s simply what happens when the brain does things over and over. This same effect occurs in people who perform Buddhist meditation , or jugglers learning to juggle , or London taxi drivers memorising the streets of London by rote . Indeed, the brain has been shown to change simply with hormonal fluctuations that occur throughout the menstrual cycle . Prayer might change the brain, but so do a lot of other things that have nothing to do with prayer. 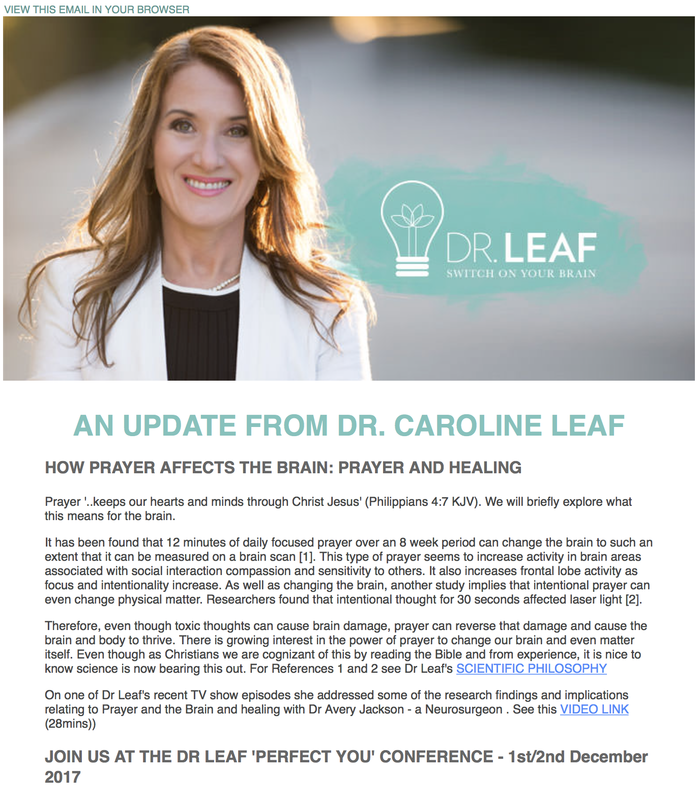 Not that these pesky facts stop Dr Leaf from going on to state that, “As well as changing the brain, another study implies that intentional prayer can even change physical matter. Researchers found that intentional thought for 30 seconds affected laser light.” To start with, this study  that Dr Leaf refers to was nothing to do with Christian prayer, and all to do with Buddhist-type meditation … to use this ‘experiment’ as support for prayer is misleading. It’s also misleading because the results were essentially the interpretation of the experimenter. The same experimental design performed by independent laboratories showed no effect of thought on laser light  (see also “Dr Caroline Leaf – Where Angels Fear To Tread“). So intentional thought doesn’t change physical matter, and why should that be any surprise? Prayer might change things, but the effect of prayer has nothing to do with us. We don’t change physical matter, only God does, since He created matter in the first place. Dr Leaf is simply setting up a false premise so she can solve it – ‘You cause brain damage by your toxic thinking, but you can heal your brain damage by your non-toxic thinking’. But toxic thoughts do not cause brain damage, so there is no brain damage from toxic thinking for prayer to reverse. The pathetic excuse for ’science’ that Dr Leaf relies on to support her ministry doesn’t show any effect for the power of prayer. As Christians, the power of prayer is a matter of faith and reliance on the power of God, not our own strength. Scholz J, Klein MC, Behrens TE, Johansen-Berg H. Training induces changes in white-matter architecture. Nature neuroscience 2009 Nov;12(11):1370-1. Maguire EA, Woollett K, Spiers HJ. London taxi drivers and bus drivers: a structural MRI and neuropsychological analysis. Hippocampus 2006;16(12):1091-101. Hagemann G, Ugur T, Schleussner E, et al. Changes in brain size during the menstrual cycle. PloS one 2011 Feb 04;6(2):e14655. Radin D. Testing nonlocal observation as a source of intuitive knowledge. Explore: The Journal of Science and Healing 2008;4(1):25-35. Alcock JE, Burns J, Freeman A. Psi wars: Getting to grips with the paranormal: Imprint Academic Charlottesville, VA, 2003. This entry was posted in Biological, Caroline Leaf, Psychological, Spiritual and tagged cognitive neuroscientist, criticism, dr caroline leaf, false teacher, juggling, London, menstrual cycle, nonlocal, prayer, pseudoscience, radin, taxi by cedwardpitt. Bookmark the permalink.